A lot of commentators have been comparing the resignations of seven MPs from the Labour Party on Monday to the formation of the Social Democratic Party (SDP). But why has the latest twist in Westminster’s political layout reminded some of events dating back almost 40 years? In January 1981, four members of the Labour Party – Bill Rodgers, Shirley Williams, Roy Jenkins and David Owen – made the decision to resign. Featuring former ministers and standing MPs, the group earned themselves the nickname of “the gang of four”. The resignation of their memberships followed the party’s Wembley conference earlier that month, with the cohort issuing what became known as the “Limehouse Declaration” from Mr Owen’s house in the east London area of the same name. The four were unhappy with the direction Labour was moving in – namely, to the left – and, in their statement, claimed “a handful of trade union leaders [could] now dictate the choice of a future prime minister”. The founders wanted “a new start in British politics” and proposed a Council for Social Democracy to “rally all those who are committed to the values, principles and policies of social democracy”. The leader of Labour at the time – Michael Foot – said he wanted them to stay and help to shape the party. But two months later, that council became the Social Democratic Party and eventually 28 Labour MPs would join the ranks, as well as one Conservative. In June of the same year, the SDP joined in an electoral alliance with the Liberal Party to take its “new politics” to the polls. Ms Williams was the first member to stand as an SDP candidate and win, taking the seat of Crosby in October 1981. And come the election in 1983, the alliance was shown to have growing support – securing almost 25% of the vote. But thanks to the “first past the post” voting system in British elections, this amounted to only 23 MPs. After the election, however, Mr Foot, resigning as leader, blamed the alliance for siphoning off Labour votes and giving Margaret Thatcher and the Tories another term in government. The alliance went on to fight another election, in 1987, but again failed to make much of an impact on the numbers in the Commons – with almost 23% of the vote amounting to just 22 MPs. 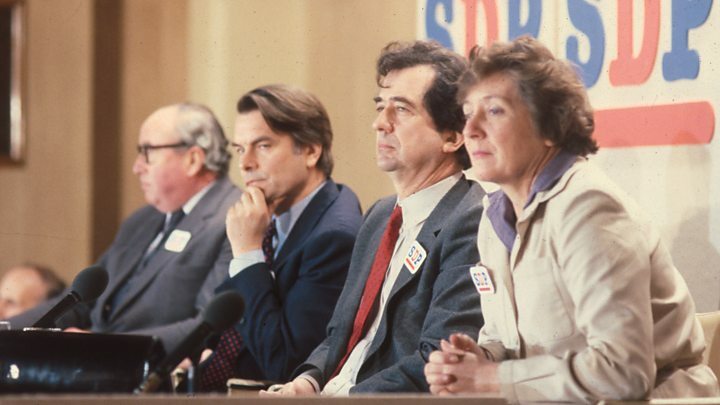 It was decided in 1988 that the SDP and the Liberal Party should merge – and the Liberal Democrats were born in October 1989. Mr Owen was unhappy with the decision and formed a new version of the SDP in 1990. But it dissolved quickly and subsequent incarnations have not managed to make an impact on Westminster elections.